The two of them are as close as sisters, but Yajima's not holding the oneesan role, Hagiwara is? Kicking off from that, they look back on their 10 years together. I think that you've always been close, but recently it seems like Mai-chan's the oneesan, while Maimi-chan's the imouto. Hagiwara: Is that how things seem~ (laughs). Maimi-chan's the older one, so I think of her as the oneechan though. Yajima: You were still completely tiny back then, so I'd dish up meals for you when it was time to eat. I wanted to give you anything you wanted. As the youngest at home, I'd always wanted a younger sibling, so I was glad to become an oneesan. But as we grew up, it's like I'm the one who's slowly getting babied (laughs). Lots of people have told me that I've become more childish after having hit the age of twenty. That's how it is. 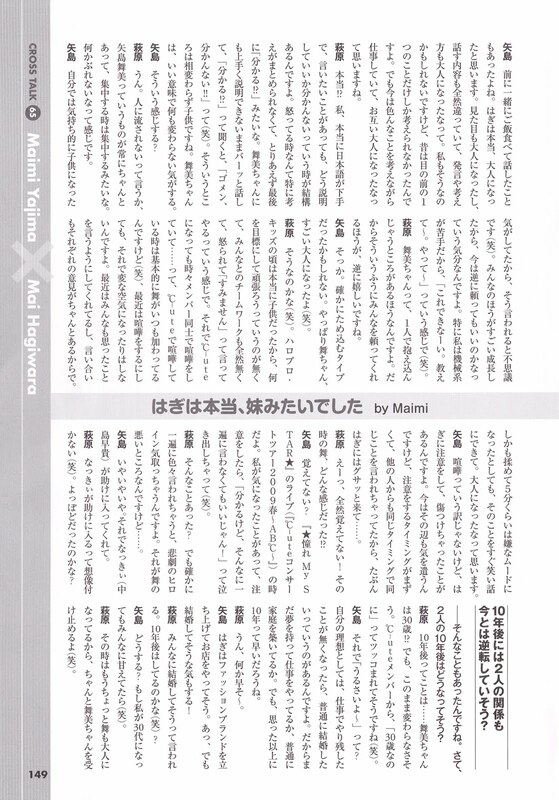 Hagiwara: I was really pampered by Maimi-chan in the past (laughs). It was like I could do no wrong, since things would be fine with Maimi-chan by my side. I feel like I brought Maimi-chan along with me even when I went to the washroom (laughs). Yajima: Hagi would always watch me whenever I put on my make-up. Hagiwara: I'd often have fights with (Okai) Chisato when we were in the Hello! 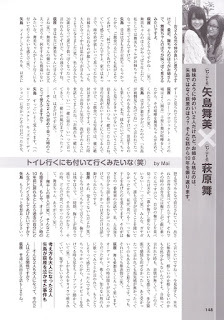 Project Kids, so I had Maimi-chan bring an end to those fights (laughs). 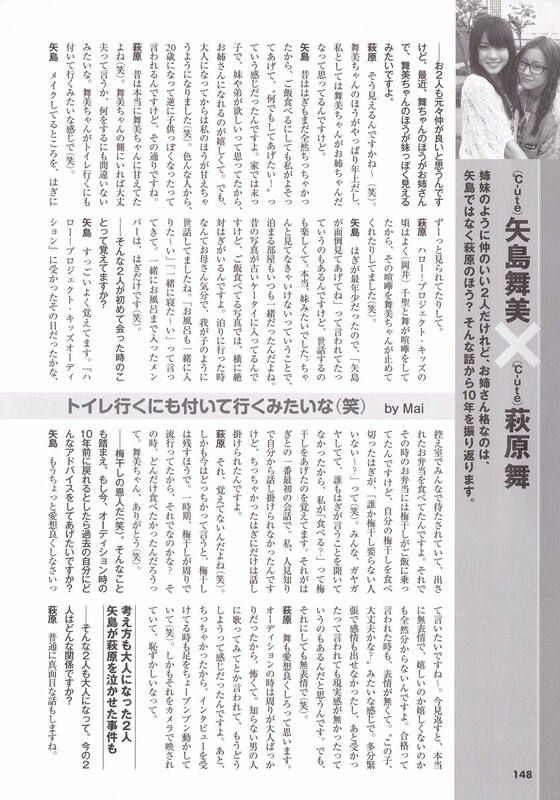 Yajima: I was asked to look over Hagi as she was the youngest, but I enjoyed looking after her. She really was like a little sister to me. As I had to keep a proper eye on her, we'd always stay together in the same room during overnight stops. I have some pictures from the past in an old mobile phone, and in photos taken during mealtimes, Hagi would definitely be next to me. When we had to stay overnight somewhere, I kind of felt like her mother, and took care of her as if she were my kid. I'd ask her to bathe with me and go to bed with me. Hagi alone is the member that I've gone to the extent of bathing with (laughs). Do you remember the first time the both of you met? Yajima: I remember it really well. I think it was the day that we passed the 'Hello! Project Kids Audition'. We were waiting in the waiting room and eating the bentos that had been prepared. At the time, it was umeboshi on rice, but Hagi had eaten her own umeboshi and was asking if there was anyone who didn't want theirs (laughs). Everyone was busy chatting away and didn't hear what Hagi said, so I offered Hagi my umeboshi. That was my very first conversation with Hagi. My shyness wouldn't let me start a conversation, but tiny little Hagi was the only one that I could talk to. Hagiwara: That, I don't remember (laughs). And now, I'd tend towards not eating umeboshi. At a point in time, umeboshi were all the rage. I wonder why? At the time, I had to have them no matter what. Maimi-chan, thank you (laughs). She was your patron of umeboshi (laughs). On that note, if you could return 10 years back to when you auditioned, what sort of advice would you like to tell your self from the past? Yajima: I'd like to tell her to be a bit more engaging~ Looking back on it now, I was really expressionless, you wouldn't be able to tell at all whether I was happy or not. Even when we were told that we had passed, nothing showed on my face. It made people wonder if I was all right. I probably couldn't bring any expression to my face due to nerves, and I think that it also didn't feel real when we were told that we had passed. Nevertheless, I was expressionless (laughs). Hagiwara: I think I'd tell myself to be more engaging as well. At the auditions, we were completely surrounded by adults, so I was scared. Being told by an unknown man to try singing, I was perplexed. And as I was small, my legs were really shaking when I was being interviewed (laughs). What's worse is that it was all caught on camera, which made me embarrassed. The two of you have now grown up. How is your relationship now? Hagiwara: We have normal, straightforward conversations. Yajima: We talked about it when we had a meal together before. I think that you've really grown up. You've also matured in looks, and the things we talk about have also changed, your observations and your way of thinking have also matured. Back then, you could only think about what was directly in front of your eyes, though I might have been the same way as well. But now we can work while keeping all sorts of things in mind, so I guess the both of us have grown up. Hagiwara: Really!? I'm really bad with Japanese, so even if there's something that I want to say, a lot of the time, I have no idea how to explain it. Particularly when I'm angry, I can't put my thoughts together, so I'll just end it with an 'Understand!?' Even with Maimi-chan, when I can't explain things well, I'll ask you if you understand. Yet you'd reply 'Sorry, I didn't get that!!' (laughs). In that way, I'm still a child, as always. I feel that Maimi-chan, in a good way, hasn't changed at all. Yajima: Is that how it seems? Hagiwara: Yup. It's like you don't get swept away by people, you're always constantly present as Yajima Maimi. When I focus on you, you're solid as a rock. I feel that you don't waver. Yajima: I feel like emotionally, I've become childish, so it's strange to be told that (laughs). Everyone's grown up, so I feel that it's all right to leave things up to the rest. I'm particularly useless with machines, so I'm always asking for help with them (laughs). Hagiwara: Maimi-chan, you're the type that keeps things to yourself. So we're actually glad that you're depending on us like that. Yajima: Is that so? That is true, I'm probably the kind of person who stashes my feelings away. Mai-chan, it looks like you've really matured (laughs). Hagiwara: Is that where you're going with this (laughs). I really was a kid during the H!P Kids era, so I had no long term goals to work for, I had zero teamwork with the rest, and I'd just say 'sorry' whenever I got scolded. Even having become part of ℃-ute, I'd still fight with my fellow members... That said, when ℃-ute were having fights, I'd be adding fuel to the fire (laughs). But recently, even when we fight, the atmosphere doesn't get strained. Nowadays, everyone says what they're thinking, and even when there are disputes, we each have our own opinions. What's more, even if we get into a bad mood for about 5 minutes after a fight, it immediately becomes something we can laugh about. I guess we've grown up. Hagiwara: Eh, I don't remember that at all. What was my situation at the time!? Yajima: You don't remember? It was during the '☆Akogare My Star☆' concert ('℃-ute concert tour 2009 Haru ~AB℃~'). There was something I was concerned about, so I warned you about it, but you left crying, saying 'I know already, you don't have to tell me all of it all at once!' (laughs). Yajima: No no no. Nacky (Nakajima Saki) helped you out from that. Hagiwara: I can't imagine Nacky helping me out (laughs). Must have been much more than that, I guess? It seems that in 10 years time, their current relationship will have reversed? Things like that happened, huh? How will the two of you be like in 10 years time? Hagiwara: 10 years time... Maimi-chan'll be thirty!? But I don't think that she'll change from how she is. I feel like the ℃-ute members will tsukkomi her with an 'Even though you're thirty' (laughs). Yajima: And I'd reply with a 'Pipe down about that~'? Ideally, there'll be nothing that I've left undone in terms of work, and I'll just get married. So maybe I'll work as long as I have dreams, or maybe I'll just raise a family. But 10 years will come faster than we know it. Yajima: I feel like Hagi will set up a store promoting her own fashion brand. Ah, but I feel that you might get married! Hagiwara: Everyone says that I'll probably get married. Will I have tied the knot by the time ten years have passed (laughs)? Yajima: How about it? Maybe I'll still be pampered by everyone even when I'm in my thirties (laughs). 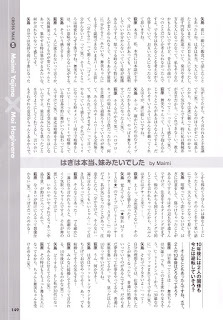 Hagiwara: I'll have grown up a bit more by then, so I'll properly receive Maimi-chan (laughs).